Cooking a flavorful and exciting breakfast is something you will always love about lazy Sundays. The juicy and crispy waffles are one of the best choices to make your weekends even more memorable. This is because waffles are the way too simple to make. Just prepare the batter and put it in the best waffle iron and wait for it to notify you. Generally, there are two types of waffle makers you can choose from – American (or classic) waffle makers and Belgian waffle makers. It is wise to choose a waffle iron which has all the features you want. We recommend you to buy Belgian style waffle irons because they are thicker than American ones. They are also deeper to put syrup, butter, or anything over the waffle. It is also up to your own preferences. You can mostly find Belgian waffles in the market. What are the benefits of a Waffle Maker? Waffle Makers have gained a lot of popularity in recent time and it is all because of the various benefits they offer. If you think that these waffle makers offer only a couple of benefits then you are probably wrong as there are almost half a dozen of benefits offered by the waffle makers. Here are some of the benefits of owning a waffle maker. Waffle Anytime – A Waffle Maker is a perfect answer to you midnight craving. You can have waffle anytime you want and you do not have to worry about visiting an eatery at midnight if you feel like having a waffle at midnight. This is certainly very convenient and believe it or not, you will fall in love with the waffle maker because of the flexibility it offers. Homemade Quality Waffle– It is often said that the quality of ingredients used by the café can vary. Some may not use good quality ingredients which can cause gastric problems. If you are having a waffle maker and if you are making your waffle then you can certainly use the best quality ingredients and you can also use low carb flour for cooking. Hygienic Cooking– This is not to scare you but the fact is that some of the eateries have a very poor hygiene and eating at such places can certainly make you ill. If you are making waffles at your home then you do not have to worry about the hygiene as you can certainly clean the waffle maker yourself before making one. Customize as per Your Need– Another interesting part about having your own waffle maker is that you can customize your waffle as you want it. 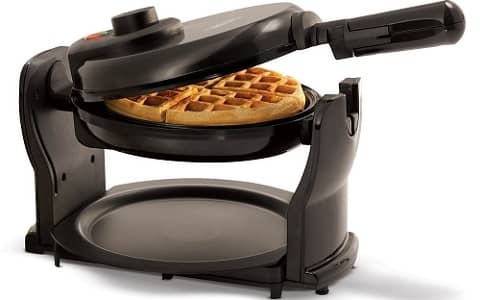 You can experiment with a waffle sandwich or a waffle cone as this waffle maker comes with several attachments to help you in cooking. 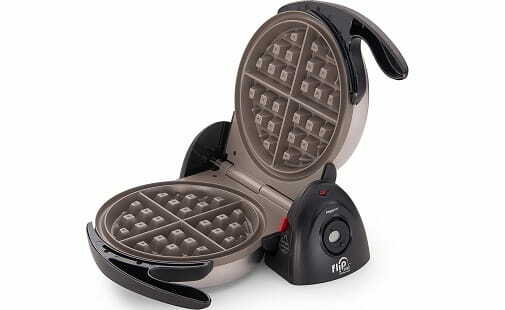 Easy to Use– Waffle Makers are also very easy to use. Today, it takes hardly 15 minutes to make your own waffle and they are not messy either. They require minimum maintenance and cleanliness as the waffle makers are Teflon coated so that the batter doesn’t stick to the waffle maker. Saves Money– Lastly, if you are a foodie then you can also save a lot of money with a waffle maker. You can make waffles for a picnic or for your friends and they will certainly fall in love with you.You can easily save as much as 80% of each waffle that you make with these waffle makers. Preparing waffles have never been so easier. This list of best waffle makers will help you make an informed decision. 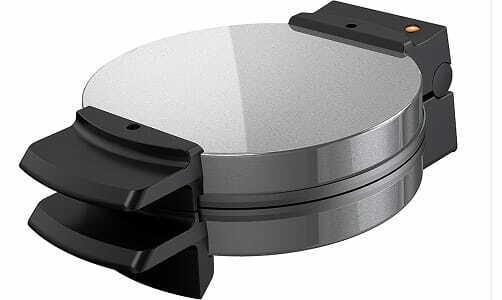 Presto 03510 is blessed with its restaurant-grade design and rotating system to spread the batter in its grid evenly. The round waffles in this baker split evenly into four different sections. Once your waffles are smoking, crisp, and ready to eat, its countdown timer will let you know. Waffles are cooked well as it flips 180 degrees. It can save a lot of counter space as the base locks and flips in vertical form. You can get the exact time in its digital timer when your crispy waffles will be cooked. So, there is no need to stay around it. Don’t go with the time mentioned in the manual or you will get burnt waffles by exceeding its exact preparation time. 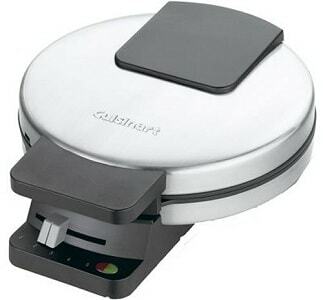 Cuisinart WMR-CA Round Classic Waffle maker has five different settings for browning waffles. It means you can decide how crispy you want your waffles to be. It also ensures complete peace of mind as 3 years of warranty stands by your side. The dual indicator lights in the waffle maker will tell you when it’s the right time to bake waffles and when to eat. It is just the matter of few minutes to bake typical round waffles. 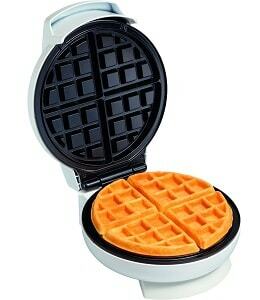 The rising waffles won’t push up its weighted lid and it has rubber feet to keep the baker stable. It is also easy to store as it stands vertically. The best part of this machine is its reliable heat settings. Even after you exceed the temperature limit, it could get back to normal. Handles are screwed to the body. Over time, they loosen and fall out. It is also difficult to retighten handles because of their design. 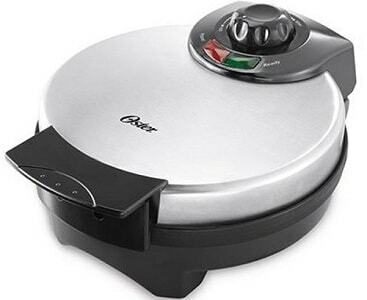 Oster Waffle Maker is designed to bake delicious and creamy Belgian waffles to indulge in the rich feeling at home. Prepare professionally-baked waffles with deep pockets filled with delightful syrup and toppings on its 8” plate. Cook with passion at your own home and serve your family and guests. It is easy to control temperature and handles remain cool all the time. 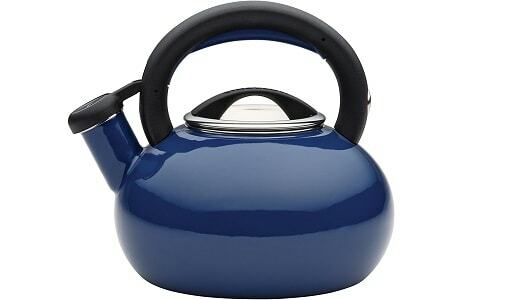 The sleek stainless steel body makes it more elegant. There is not much control over cooking time and temperature. Many people needed to guess take out time. Hamilton Beach 26030 is a flip Belgian waffle maker with cool-touch handle that is easy to flip and keep your hands safe while flipping. You can also fold the handle for easy storage. You can also detach drip tray and grill plates which are dishwasher safe. You don’t have to spend much time cleaning it. Get inspired to prepare restaurant-quality waffles at your home thanks to its browning control and flip design. 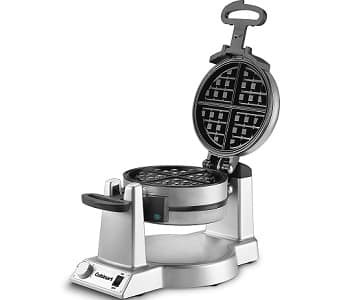 With BLACK+DECKER WMB500 stainless steel traditional Belgian style waffler, breakfast is always restaurant styled. This waffle maker has deeper non-stick grids to turn out fluffy, dense waffles with a lot of space to add your delightful toppings. It has easy to clean nonstick plates that make it the best choice to bake different foods, including, grilled sandwiches, hash browns, cinnamon rolls, and brownies. Always stay inspired to experiment with new treats and bake your all-time favorite waffles. Proctor Silex 26070 Belgian style waffle baker is your best bet to bake restaurant-worthy, fluffy Belgian waffles within minutes. It heats up quickly and has indicator light to inform you when it is preheated. You can enjoy delicious waffles within minutes. 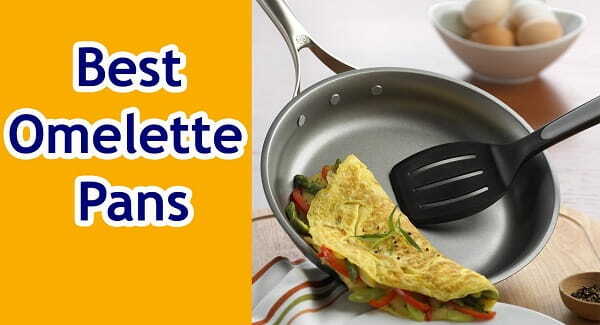 Usually, non-stick plates don’t need oil or butter. So, these are easy to clean up. You may always like to enjoy waffles with kids on breakfast. You can prepare sweet or savory waffles for lunch, breakfast, dessert or dinner. 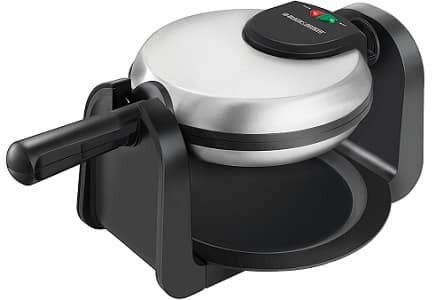 BLACK+DECKER Flip Waffle Maker is your best companion to make fluffy and thick waffles which hold all your desired toppings and soak up syrup. With a flip of handle, the cook and rotate system makes delicious and crispy waffles. Its waffle plates are non-sticky and easy to clean up. They are the best choice to make different foods, such as grilled sandwiches, hash browns, cinnamon rolls, brownies, and even more. It has ready indicator lights to show when it is plugged in and when waffles are ready. Buy Cuisinart WAF-F20 double Belgian waffle maker to bake delicious and extra-deep 1 inch restaurant-worthy waffles at your kitchen. It bakes two waffles at the same time. Simply add fruit or syrup and enjoy the delicious breakfast at home. The rotary feature flips waffle 180 degrees for even cooking on bottom and top. The browning control knob cooks both waffles from light to fluffy to brown and crispy. Enjoy fluffy and crisp Belgian waffles in minutes at the comfort of your home. It works with different gluten free and wheat batters. You can cook crispy and even waffles with cool-touch handle and rotating feature. 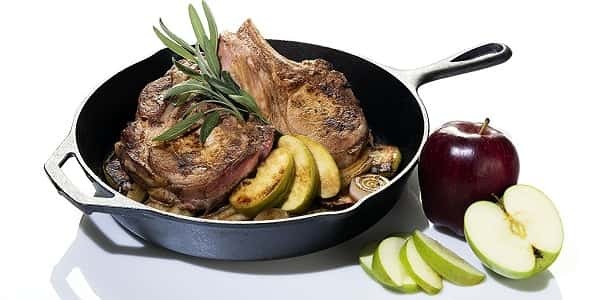 Non-stick coating can easily give you smooth and easy cooking. You can easily pull out waffles in single piece without getting them stick. It has control knob to provide nine browning settings to cook waffle. It features three non-stick coatings from non-stick to copper and ceramic titanium coating so you can cook almost anything. 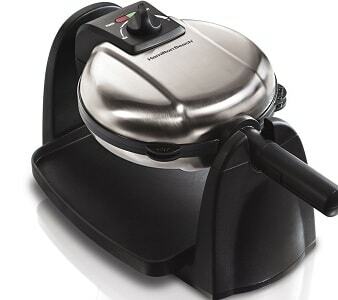 It has accurate browning control and indicator lights to keep your waffles brown and cooked right every time. 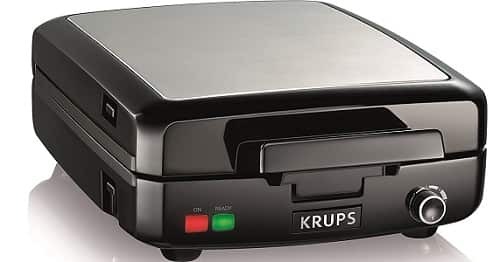 Enjoy the crispy Belgian waffles with one touch with this KRUPS Belgian Waffle Maker. It makes up to 4 waffles in one circle to cook Sunday morning faster for the entire family. It has five adjustable browning settings to choose the browning level you like. You can enjoy the waffles you like. It has easy to remove die cast plates for easy cleanup. Do You Really Need a Waffle Maker? Dipped in whipped cream or juicy maple syrup, waffles have become the perfect staple for lazy Sunday mornings. Most of us just crave for it but can’t afford it for breakfast. This way, it is always wise to choose the best Belgian waffle maker which saves you from buying a boxed mix for a long run. One recipe costs you a lot when you make them yourself or buy a boxed mix. You don’t have to stay around the stove top and wait for the time when you have to flip them just like in case of pancakes. On the other side, you need to set timer on the waffle makers, see the indicator or just wait for beep to get your juicy waffle out. With little effort, you can prep your decadent and favorite breakfast. However, waffle makers can do more than just cooking waffles. No matter it has extra grill plates or not, it is also the best choice to prepare pressed sandwiches with some nice grid marks. 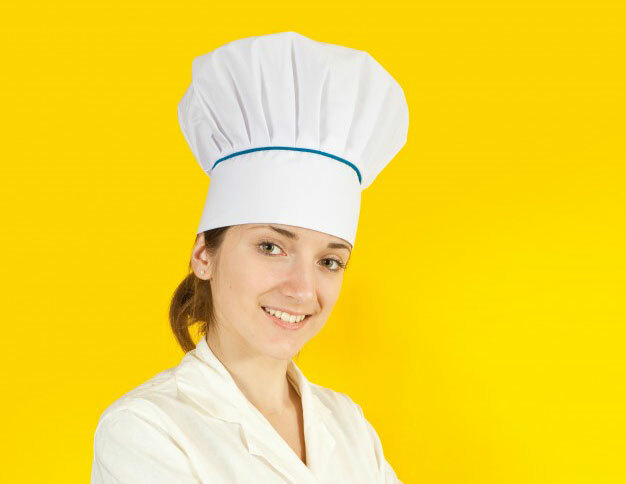 You can find a lot of recipes out there to learn how to bake delicious dishes. It is a lot more convenient and faster than baking food in an oven. Whether savory or sweet, you will definitely love this handy dish. Waffle Maker Buying Guide – What to Look For It? Waffle makers usually vary by prices. In general, you may want to spend around $20 to $40. But if you want one with more features, you can spend up to $130. A cheaper unit is good for basic tasks. But if you don’t want it to break after using within a few months due to poor quality parts, it is recommended to go with better quality. 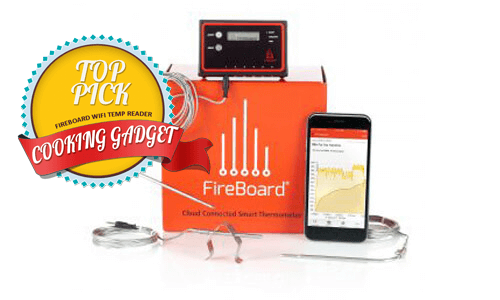 You may want to pay extra for more features like flip plats, temperature controls, etc. Generally, modern waffle makers are very simple to clean. All you need to wipe it with damp cloth and then a dry one. Waffle makers without detachable plates can be painful because it is not that easy to reach the corners. Make sure the grill plates are removable and safe to use in dishwasher. They are a lot simpler to clean. Waffle makers may last from a few months to years. It’s up to the quality. So, before making any decision, we recommend you to read users’ comments to know how long your desired machine may last. If you buy a quality machine and take proper care of it, it can last for years to come. What is the best way to clean a waffle iron? So apparently, a lot of people are not sure about how they clean the waffle iron and them often making mistakes while cleaning a waffle iron which can certainly result in burns. Here is the best way to clean your waffle iron. Just follow the steps mentioned below. -} First of all, you need to unplug your waffle maker and allow it some time to cool down or else you may end up getting a bad burn. Wait for some time until the waffle maker is completely cool. -} Now, use a tissue or a paper towel to wipe off the excess oil which is sticking to the cooking plates. You would have to clean between the grids. Also, remove the large crumbs of the waffle and that can be done easily with a soft brush. If you have a waffle maker with removable cooking plates then you can simply take them off and wash them in a dishwasher. -} You can now use a slightly moist cloth to rub and remove the waffle bits which are sticking to the cooking plates. Alternatively, you can also use a rubber spatula to remove the hard leftovers of the batter. -} Lastly, clean the body of the waffle maker with a slightly damp cloth. Ensure that the cloth is not dripping with water or else it may damage your waffle maker. Do not use sharp object while cleaning the cooking plates as it can damage the non-stick coating of the waffle maker. Waffles have always been the perfect staple as 2-minute snacks for full family. Soft and warm on the inside and crunchy on the outside, you just can’t resist your love for home-baked waffles to satiate your hunger and to nurture a cook within you, thanks to the Belgian style waffle makers listed above. We hope you’ve liked this list and buying guide to make an informed decision.